A 2016 survey by the Reason Foundation ranked the Massachusetts Highway Department 46th in the nation in overall customer satisfaction. The four-year saga of a proposed reconstruction plan for Beach Road in Vineyard Haven shows why this low ranking is so richly deserved. Beach Road is arguably the Island’s most important road; it is certainly the ugliest. The road fronts a harbor once given almost entirely to maritime uses. Many are gone. From Five Corners to Winds Up, the road is marked with more than 40 driveways, some leading to vacant lots and buildings long ago lost. But there are stirrings of new life. Several top-of-the-line restaurants, offices, art galleries and the Tisbury Marketplace are just some of the new businesses along the road. On the harbor, Gannon and Benjamin anchor one of the country’s premier wooden boat building companies. The Beach Road corridor is zoned commercial and is also designated as a waterfront cultural zone. Serious people are presently exploring ideas to bring the waterfront alive again. This is the context in which Mass Highway began planning. Trouble ensued at the first meeting in the Katharine Cornell Theatre. Rather than using that meeting to learn about Tisbury (highway planners call it a scoping session), Mass Highway showed up with two already-designed alternatives. Each was several feet long. The roads themselves on paper were only an inch wide, making the schemes unintelligible from more than three or four feet away. I had difficulty understanding the differences and I look at plans every day. Questions from the audience suggested many others had the same problem. Each alternative required differing amounts of additional land outside the existing right of way. Beach Road is 40 feet wide. Like many older towns in New England, that width makes it difficult to squeeze in cars, bicyclists and pedestrians without taking additional land. The land needed in these schemes was several feet in width, but the exact amount, which side to put it on, which owners would be affected and whose businesses would be damaged, has been the focus of almost every subsequent meeting and scheme. If one gives more to the bicyclists, pedestrians will be shortchanged. If bicyclists and pedestrians are both accommodated, then the road won’t function — and so on and so on. Beach Road obviously must serve three users. Mass Highway now has a proposal which fails all three. Start with the bicyclists. The plan shows bike lanes against each curb, the width of the lanes marked by a painted line. The lanes should be a safe place for bikes on a crowded road. They aren’t. One of the major causes of bicycle accidents is what’s called T-boning. A bicyclist who is just behind and to the right of a motorist who decides to make a right turn (think of the number of driveways on Beach Road) has no place to escape and crashes into the car. More than 20 years ago, San Francisco recognized this problem and started allowing bicyclists in traffic. As the idea spread, the federal highway administration undertook rigorous tests and decided that absent a real bike path there were fewer T-bones. They also discovered that cyclists slowed traffic (think of the old bumper stickers saying, Slow Down You’re Not Off-Island Anymore). The idea has now spread to hundreds of American cities and towns. Mass Highway said no, they wouldn’t allow it. A wonderful irony ensued a short time later when a different Mass Highway office, not knowing of their predecessor’s decision, arrived on Island to explain and promote the option of putting bikes in traffic. Mass. Highway’s intransigence actually led to suggestions by many for an even better alternative. Rather than subjecting bicyclists to errant motorists, bullying tour buses and sand in the gutters, people started asking why not have them start at Five Corners and from there ride down Lagoon Pond Road to behind the Tisbury Marketplace, then back onto Beach Road and a real bike path. Mass Highway again said no. This alternative was not in the corridor, they said. They never mentioned that Mass Highway had drawn the boundaries of the corridor with no input from Tisbury. Moving bicyclists to a safer path opens Beach Road to be more like a town street: slower, safer and with less right of way needed. Most importantly, more room allows for a level and attractive sidewalk. The great planner Kevin Lynch wrote more than 40 years ago that Martha’s Vineyard’s roads were the Island’s front door. Nothing could be more relevant to planning a revitalized waterfront than these words. Every research organization in the United States says the absolute minimum width of a sidewalk in a commercial zone is eight feet. This includes the federal highway administration itself, which is paying for part of the cost of this work. For reference, the sidewalks on Main street Vineyard Haven average about nine feet wide. Mass Highway, pinched by their decision to leave bikes on the road, want several feet less. What is the magic of eight feet? That width allows for more than a minimum five-foot-wide sidewalk, which is level and on which two wheelchairs can pass. It also allows street trees and streetlights in the remaining three feet, set so car doors don’t hit them. I imagine foggy nights and the glow of street lights scaled to people walking home from the movies. Most importantly, it allows room for each driveway to be sloped up to the sidewalk and the property behind rather than the sidewalk itself sloped down to the level of the road. Mass Highway, of course, wants the latter. A perfect example of the effects of a sloped up-and-down sidewalk already exists on State Road up by Cronig’s. I had a friend in the car one day who had never been to the Island before. He started laughing. I asked him why. He said “look at those sidewalks!” He said they reminded him of the Toonerville Trolley, an old comic strip about a trolley car bouncing up and down over the hills. An occasional utility pole or mailbox set in the middle of the sidewalk made him laugh louder. For people in wheelchairs, that sidewalk is an obstacle course. In a rainstorm the sidewalks also allow water to slosh back and forth, bringing sand and dirt out into the gutters, which represents a hazard to bicyclists and pedestrians both. The choice is simple. Mass Highway’s alternative is dangerous for bicyclists, difficult for pedestrians, does nothing to promote the revitalization of the waterfront and is more expensive because it takes more right of way. By constructing that alternative, Mass Highway is handing the Island a bag of shells. Moving the bikes to a safer road makes a real front door to the waterfront possible. Mass Highway always touts its voluminous Project Development and Design Guide, which for almost 900 pages extols the need to work with communities. Beach Road is a chance for them to prove it. 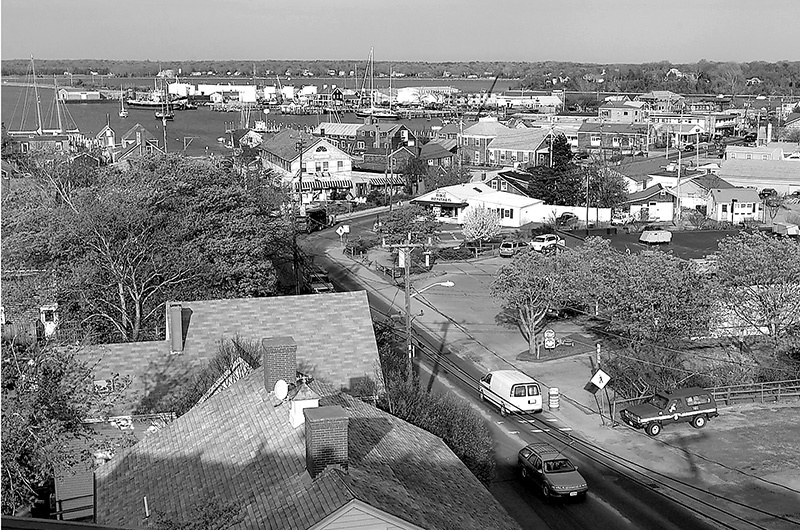 Craig Whitaker is a part-time resident of Vineyard Haven, author of Architecture and the American Dream and was an adjunct professor at New York University, teaching a course called Why Cities Look the Way They Do.